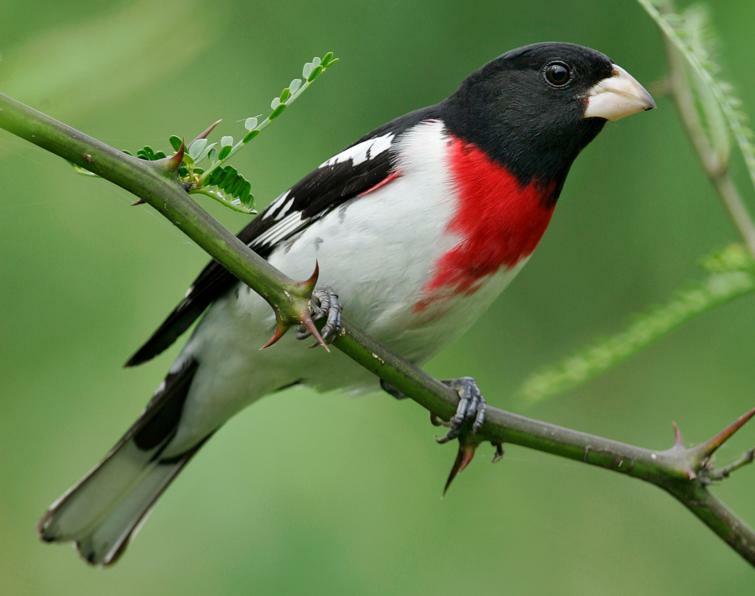 The Rose-breasted Grosbeak is a common American songbird and is one of the five species of grosbeaks that are found in the continent of North America. These birds are strikingly beautiful, and are known for their vibrant coloration. However, the females look completely different from the male, very much like a brown streaky sparrow. They have a characteristic massive bill, for which they got their name. The name “grosbeak” has derived from the French word ‘grosbec’, meaning “large beak”. Size: They are 18–22 cm (7.1–8.7 inches) in length, and with wingspan 29–33 cm (11–13 inches). Plumage/Feathers: Male is black above the head, while the below is white having a brilliant rose to red V-shaped marking on their breasts. The male birds display white wing spots when they fly. The females are brown to gray, and are heavily streaked. Eyes: Eyes are dark, and round to oval in shape. Nose: Nostrils are situated just above their beaks. Tail: A long, black and white tail. 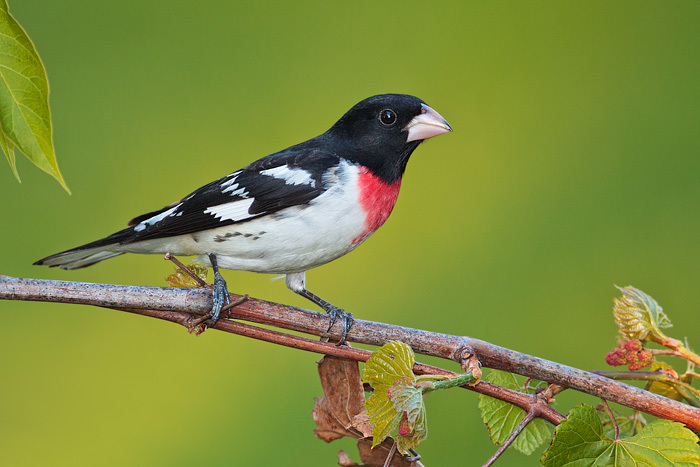 Bills/Beaks: Rose-breasted grosbeaks, both males and females, have large, pink-colored, cone-shaped and strong beaks, from which they got their name. They can live for a maximum of 13 years in the wild. However, it has been reported that, the longest living RBG lived for 24 long years in captivity. These birds breed in the northern regions of North America, starting from the British Columbia in the west and stretching to the Atlantic coast of Canada in the east, while from New Jersey in the south to the Appalachian Mountains through South Carolina, west to eastern Kansas, Nebraska, and the Dakotas. Their winter distribution is in the coastal Mexico, the Greater Antilles, and the whole region of Central America and northern South America, extending down to the east of Peru and Guyana. They primarily live in the deciduous forests, groves and orchards or in mixed woods. They prefer edges and openings that are marked by combination of shrubs, tall trees rather than continuous forests. During migration, they are found in wooded or semi-open areas, while in the winter months, the leave for the tropics, where they choose mostly the forest edges and second-growth woods in foothills and lowlands. Rose-breasted grosbeaks are migratory. During the time of migration and in the winter months, these birds are found either individually, or may remain in pairs, or sometimes seen moving in scattered flocks even mixed with other species. Their breeding and wintering ranges never overlap. They migrate usually during the night. One of the strangest behaviors in these birds is that, unlike most other territorial birds, a rose-breasted breeding pair would tolerate a male intruded inside their territory if only the migrant remains silent. If the intruding male starts singing or chirping, the territory’s male would ward it off. The owner of the territory would flick its wings, spread the tail, raise its crown feathers, and often chase the intruder along with its mate, driving it away from their realm. The female bird would also display almost a similar gesture, driving off other intruding females trying to approach its mate. 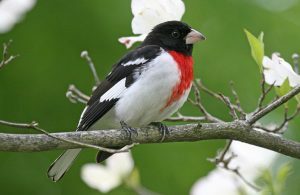 The male rose breasted grosbeaks emit calls and sing primarily to mark their territories, as also as a mating call in order to attract females. After the female grosbeak would approach, the male would keep rebuffing it for a couple of days before accepting it as a mate. However, once the act of mating is done, the pair would act monogamous. 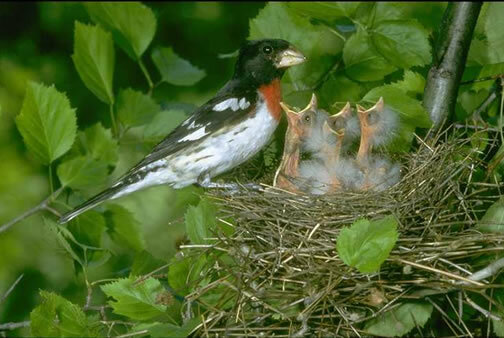 When a predator approaches their nest, the grosbeaks would noisily mob near the nest displaying aggressive behavior. When they are surprised or startled, they would often freeze. When they fly, they display an undulating flight pattern. However, these birds also have the habit of hopping on the ground. Their primary voice text is “eek-eek”. 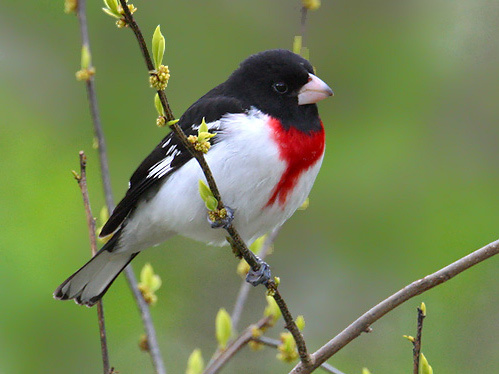 The Rose-breasted grosbeaks are known for their singing skills. They emit melodious, warbled songs that are reminiscent of the American robin. However, the song of the grosbeak has slightly shorter phrases. The distinguishing metallic ‘chink’ makes it easier to find. Other calls used include contact calls, and various squawks, chuks, and hurrrs. The female birds will also sing, but their songs are shorter and softer. You can listen to the songs of the Rose Breasted Grosbeak here. These birds are omnivores, but their food habits change from season to season. 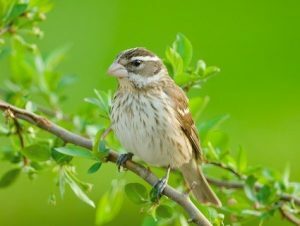 During the breeding season, the birds would approximately consume 52% insects and 48% seeds and fruits, whereas, during winter months and migration, they mostly thrive upon fruits, leaves, and flowers. They would readily consume safflower, apple slices, suet, millet, peanut kernels, and other fruits. They would also feast upon weed seeds, wild berries, and will eat domestic crops like corn, oats, peas, and wheat. In the non-vegetarian diet list, their favorite insects include bees, Colorado potato beetles, ants, true bugs, and butterfly larvae (caterpillars), grasshoppers. They would also eat spiders and snails. The difference between the male and the female is visibly evident. 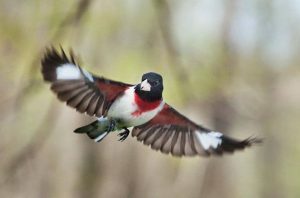 Unlike the drab-colored female, the male has a patterned black and white coloring with a bold rose-colored chest. The male birds have a jet black head and a heavy bill. Juvenile males look quite similar to the females though, but they have a rosy patch on a buff-colored chest. During the mating season, the female of the species would choose the male that can sing most beautifully. The bond between a pair of rose-breasted grosbeaks lasts for a lifetime. They mostly choose bushy woodlands and shrubby or woody growth by rivulets and streams as their site for breeding. The nest that they build together is cup-shaped and is constructed using dry leaves, straws, twigs, and the like. 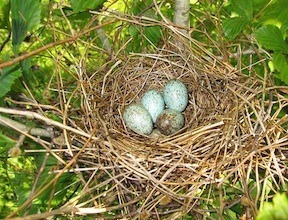 The nest is porous and the eggs therein could be seen from below. After a successful act of sexual copulation, the female would lay around 3-5 pale green or bluish color eggs with red brown markings. Unlike many other sexually-dimorphic species of birds, the eggs of the rose breasted grosbeak are incubated by both the sexes. The mother will incubate them at night, while the father for about a third of the daylight hours. When the nest exchange occurs, both birds will softly sing to each other. The female then flies off to find food and water and get some exercise, while the male incubates and guards the nest. The eggs are hatched in 12 to 14 days. After the young ones are born, they are cared by both the father and the mother. The nestlings are altricial, which means, when born, they are blind, helpless and immobile. The baby grosbeak is mostly fed with insect diets, and is able to make the first sound after around 6 days from hatching. These fledglings gradually grow up being fed by the parent birds, and are ready to leave their nest in 9-12 days. However, they would still be dependent on the adults for around three more weeks. The juvenile males seem to learn their song from the father, and are able to sing when they are about a month old. The female birds are drab and dull colored, an adaptation that allows them to hide amidst the woods and branches while incubating eggs in the nest. In the male birds, the white ramp and markings on the lateral sides of the body enhance their aggressive looks, especially when they spread their wings to ward off intruders and predators. Most predation is on their eggs and hatchlings, predated mostly by grey squirrels, and red squirrels, blue jays, and common grackles. However, the adult RBGs also fall prey to birds of prey like Cooper’s hawk and sharp-shinned hawk. The Rose Breasted Grosbeak is not a threatened species. The IUCN 3.1 has categorized them under the ‘LC’ (Least Concern) species list. Owing to the rosy (red) marking over its breast, these birds have acquired a funnily gruesome folk name – the ‘cut-throat’. In order to advertise their breeding territories, the males can sing up to 689 songs in a day. 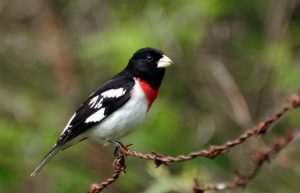 Study revealed that, the male rose breasted grosbeaks respond readily to recorded songs of Rose-breasted and Black-headed Grosbeaks, but they have been seen to attack mounted specimens of their own species 5 times more frequently than specimens of other species. 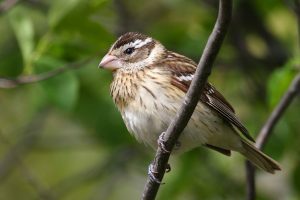 Rose-breasted grosbeaks would mate with the black-headed grosbeak in the areas where the population of both the species is less. The crossbred offspring can either inherit characteristics of both parents or just of one of them. These birds would also sing while in their nests. This is quite unusual since most species tend to be very quiet when around their nest so as to avoid being spotted by predators. I live in deep East Texas and we don’t see these very often but a few weeks ago saw a male Rose-breasted Grosbeak, beautiful bird, yesterday saw a female. Just spotted a set of male in southern Indiana. Rural Bicknell. They were so beautiful and captivated our attention! They ended up flying to the woods behind our home after a while.